As risk managers, we are always trying to avoid the big downturn. The direction of the stock market, like a basketball game, cannot be determined with absolute certainty. Over the last 35 years, most of the April gains have been in the second half of the month. I've been watching the basketball games of March Madness along with a good part of the nation. Since I went to both Michigan schools in the Tournament, I was, of course, especially interested in the University of Michigan (U-M) and Michigan State University (MSU) games. The most recent games for each school were very different and led to opposite outcomes. You may recall that U-M's last game ended with a 63-44 drubbing at the hands of Texas Tech University (TTU). At halftime, the score was 24-16. Just one minute and 48 seconds into the second half, TTU had scored 5 points to Michigan's zero, and ESPN's probability projection was saying that TTU had a 90% chance of winning. A 13-point lead early in the second half sent TTU to a near certainty of winning, even though at the beginning of the game they were deemed to have just a 51% chance of winning. According to the ESPN computer algorithm, it appears that once a team gets sufficiently far into double figures, its likelihood of winning soars. But earlier in the game even with a lead of eight, the game was still in doubt. In contrast, No. 2 seed Michigan State ended up beating Duke by a single point, despite the fact that Duke was the top No. 1 seed and a team that the ESPN computer deemed-at the start of the game-a 58% probable winner. ESPN's probability score never reached the 90% certainty level of an MSU victory until the last six seconds of the game. Even when Duke had a nine-point lead in the first half, and MSU a four-point halftime and a six-point second-half lead, the probability score never indicated a virtually certain victor. I'm sure Duke's fans felt, given their last-second victories earlier in the Tournament, that even with six seconds to go, the result was still not certain. Yet this time the computer-generated projection was right and MSU gained the victory. It's the same with methodologies created to trade the stock market and other financial markets. The more the market prices move in a positive or negative direction, the more certain trend-following approaches become of a continuation of the trend in the direction of that movement. As risk managers, we are always trying to avoid the big downturn. We want to be out of the market, not for every slight move up or down, but rather, for the moves down of 30%, 40%, yes, even 50%-plus! As a result, it is quite likely that there will be no sell signal by many stock market indicators until the market has already fallen by double digits. Yet, just like in the Texas Tech game, once double digits are registered, the certainty of a downturn nears 100%. As the chart below demonstrates, the character of stock market declines changes dramatically as a stock market tumble accelerates into a virtual rout. Small declines are short, numerous, and they have a brief recovery time. But at the 20%-plus level, downturns are rarer, the extent of the decline is major and long, and it is difficult and time consuming to bounce back from them. In managing portfolios with a goal to avoid major declines, a dynamic risk management firm like Flexible Plan Investments cannot ignore a 19% decline. At that point in the peaks and valleys of a market cycle, history tells us that you are better to be safe than sorry. The loss from another 50% decline in the S&P 500 would be too great. If an investor stayed invested, the likelihood of being caught up in a spiral downward into the major long-term declines of the bottom half of the charts is too high to stand pat. A second lesson from the two March Madness games is also evident. The games demonstrate that for parts of almost any game the ultimate loser can have a better-than-average chance of winning. At three different times early in the game, U-M, the eventual loser, was determined most likely to win its game. Both teams in the Duke-MSU game were found likely to win at multiple points throughout that game. Why, at just 5:08 into the first half of the game and sitting with a nine-point lead, Duke was an 82.9% likely winner. And with just one minute and 33 seconds to go, they were sitting pretty with a three-point lead and a 73.6% chance of winning! Yet a Duke win was not to be. The direction of the stock market, like a basketball game, cannot be determined with absolute certainty. Just as there is no certainty of the outcome until the final horn sounds, the direction of stock prices cannot be determined for certain except in hindsight. In 2018, the stock market dropped twice by double digits, flirting with 20% downturns. Like the games where both sides had many chances to win or lose but only one victor, the market provides higher and lower probabilities as prices rise and fall. Yet for the most part, dynamic risk-managed strategies ignore these small fluctuations in probabilities. They don't sweat the small stuff but they also can't ignore the big moves. When the market spirals suddenly lower, dynamic risk-managed strategies will not rush for the exits, but will instead monitor their indicators for a longer period of time before they leave. This makes them susceptible to being whipsawed at lower levels, with greater losses than strategies designed for the shorter term. One way to try to avoid this happening to your portfolio is to make sure you diversify among strategies. Use both short- and intermediate-term targeted strategies in your risk-managed portfolio. Just as most games during the NCAA basketball tournament are decided in accordance with the odds, market strategies are designed to achieve their goals most of the time. Trends persist most of the time. When they reach a given level, they usually continue their advance or decline for long enough to profit. Yet that is not always the case. A 19% decline in stocks can turn the stock market direction on a dime on Christmas Eve and rally almost back to its old highs, just as a team with a nine-point lead and 80%+ probability of winning can end up losing a game. It's not March Madness; it's actually to be expected… some of the time. Thanks to Friday's rally, it was a good week for stocks. The Dow Jones Industrial Average gained 1.67%. The S&P 500 Stock Index rose 1.20%, while the NASDAQ Composite climbed 1.13%. The Russell 2000 small capitalization index gained 2.25%this week. Last week bonds saw further gains in March. Gold fell in price. Stocks continued higher today, breaking out of the top end of its recent trading range (see the light grey line on chart above). This follows the appearance of a Golden Cross formation on Friday (50-day moving average of prices moves above rising 200-day moving average). Both of these patterns have led to higher prices in the short and intermediate term. These join a number of other patterns appearing that have led to strong bull markets as well. 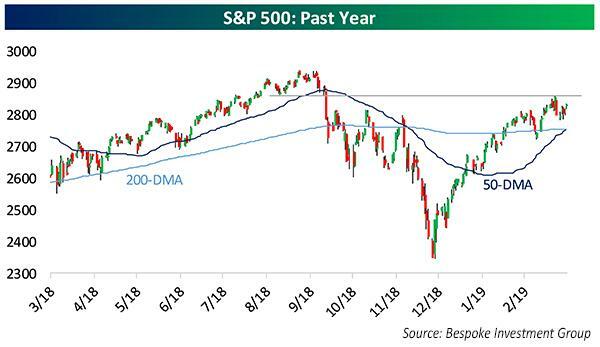 For example, according to Jason Goepfert at SentimenTrader.com, when the market is up big in the short term, while flat in the long term (over a year), stocks have rallied strongly. Similarly, he has found that when all 11 S&P 500 sectors are up 5% or more in a quarter, stocks have remained strong for up to a year longer. In fact, since 1950, when this has occurred the S&P 500's median one-year rally has been 14%, with positive results 80% of the time. Finally, a number of commentators have pointed out that when stocks have been up 10% or more in a single quarter, historically stocks have been up, on average, over 3.4% the next quarter. Jason says that when this occurs with percent of gain being matched by an equal gain in P/E, the gains have been even stronger than when the P/E doesn't at least match 75% of the return percent gain. Not everything is positive, but the negative factors seem more on the ultra-long-term side. More recession indicators are turning negative to join the inverted yield curve in predicting a recession next year. One favorite indicator that just reversed course was the Conference Board's measure of the difference between the percentage of respondents saying jobs are hard to get and those responding that they are plentiful. When this number upticks in a major way, it gives a recessionary signal. This indicator is different from the yield inversion measure which can signal years in advance. 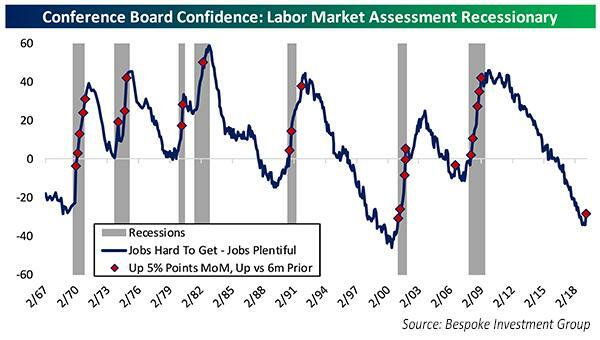 Normally, the Conference Board's labor signal occurs as a recession is beginning. In fact, since its beginning, it has given only two signals that occurred outside of a recessionary period (in 1991 and 2006). Could this mean that a recession has already begun? Recessions are only officially designated as such by economists employing hindsight long after they have started. Might the fourth quarter's drop and the surprising, subsequent adoption by the Federal Reserve Board of a dovish stance have been an early indication that the economy is slipping more than most realize? Last week's economic reports certainly don't throw cold water onto this speculation. Of the 31 reports released, 20 came in less than the level expected by economists. Today's important U.S. Retail Sales Report was down, while most economists had expected it to be up. After very weak numbers in the recent past, this too is not an encouraging long-term sign. Still, we are moving into April and that is usually very good for stocks. For both the last 50 and 20 years it has been the best month for stocks, with gains 66% and 80% of the time, respectively. However, since 1983, stocks have drifted lower for the first one or two weeks, after spiking higher the first couple of days of the month. Over the last 35 years, most of the April gains have been in the second half of the month. We have one more week of elite college basketball during which we can enjoy a brief respite from the financial markets. I've been to most of MSU's eight previous Final Four appearances (and was there for U-M's last year). This year, I'll be watching from the couch at home looking for more lessons to be learned and cheering on my Spartans-Go Green!